The Quilter’s Giving Bee is closed to donations and now the gifts are being tallied and the prizes are sent to the winners. 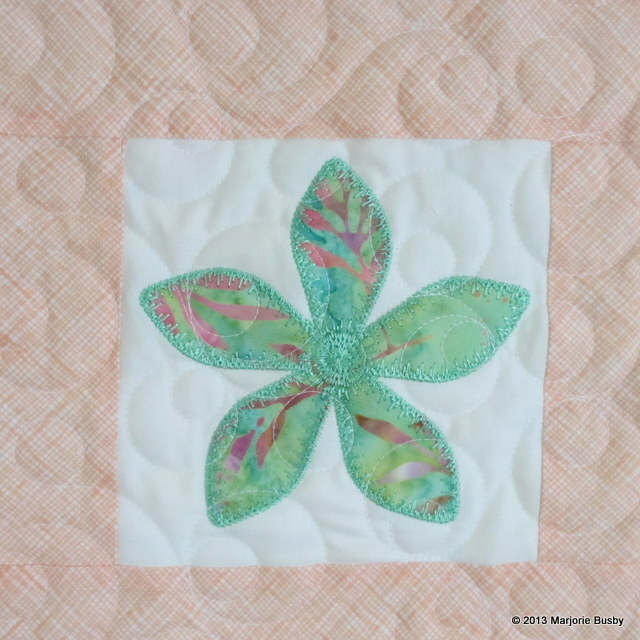 This is a big shout out to SewCalGal for organizing and sponsoring this great event, the four blogger participants and their organizations, and most of all to all of you who contributed money and/or purchased machine embroidery designs from me as a donation to HopeforHH.org. You will also find a post I wrote on the Craftsy blog for Holiday machine embroidered napkins for those of you who like to do machine embroidery on napkins. And for those of you who just want to use Christmas fabric to make napkins, here’s a link to a great tutorial for Nine Minute Napkins. I love cloth napkins and have loved making them using this tutorial. So many of the tutorials show how to fold the corners and trim, etc. This is so much quicker and easier for me. I also added links to these tutorials in my blog roll links. My twin grandsons are celebrating their 5th birthday soon and will be having a birthday party with invited friends their own age. Always in the past, their birthday has been a family occasion. As a party favor, my daughter decided that they should give Superhero Capes, as the twins love them so much. It seems like a lot, but the party is for two children so that makes it a bit more reasonable. 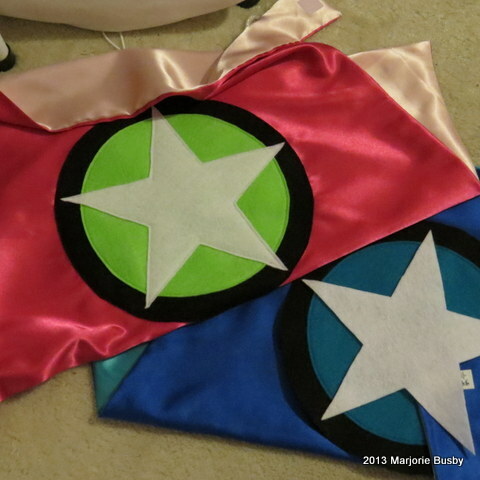 The capes were made by PipandBean Etsy Shop, and they are adorable. The colors are absolutely wonderful. The cost of having Pip and Bean add the emblems to 20 capes was too much, so Grandma was tasked (actually Grandma volunteered) to make and add emblems to each cape. And I have been totally immersed in that the past three days. Here are some pictures of my adventures. 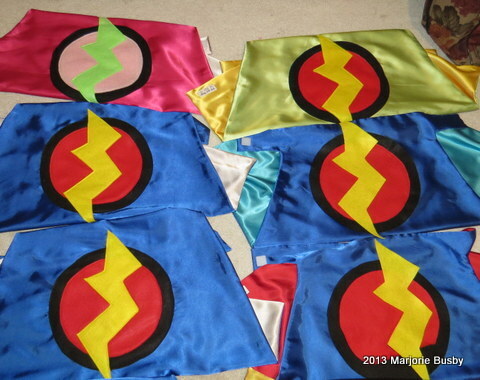 Unfortunately the emblems are too large to cut with an AccuQuilt, so they have all been cut by hand. I do wish I had ordered the bullseye Studio dies, as I would have loved having the smaller circles cut so nicely with it. The outer circle is 10-1/2″ (used my longarm circles for that. However, I have three rotary cutters and none of them would cut through the eco-felt or the wool felt, so they all had to be cut with scissors. Also tried the Silhouette on the eco-felt and that didn’t work either. This sounds like a challenge that should be pursued. . .I have cut smaller felt shapes with my AccuQuilt and it cuts great. 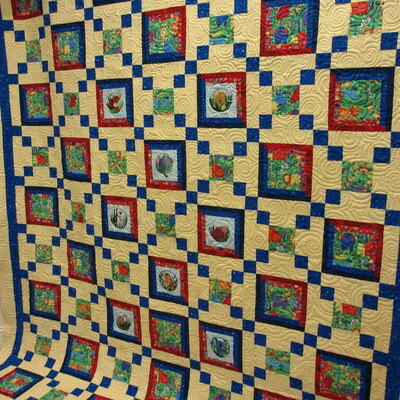 I am going to make two quilts in the next couple of weeks. One is for Gene Black’s Quilt Angels that provides quilts to young people who are in a shelter situation. 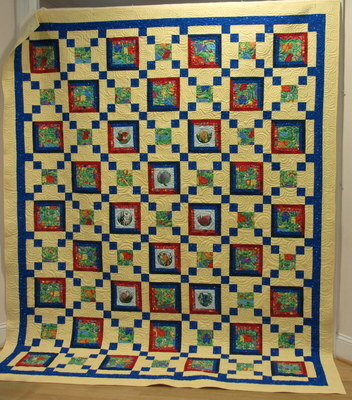 The second is a quilt for the mother of my daughter’s friend Katie. Katie’s Mom has just been diagnosed with breast cancer and will be having surgery and chemotherapy beginning right away. I am asking your suggestions for Katie’s Mom’s quilt. Katie and Em both thought pink would be the right color. And they thought the grandchildren could make handprints with paint on fabric to be part of the quilt. My suggestion was that they do the handprints on paper and let me make jpgs of them to print on fabric as that would hold up better than paint so the quilt can be machine washed. This is a very nice quilt with pink ribbons. And here’s a Pinterest board with lots of eye candy for pink ribbon quilts. And this is a search of all of Pinterest for breast cancer quilts. 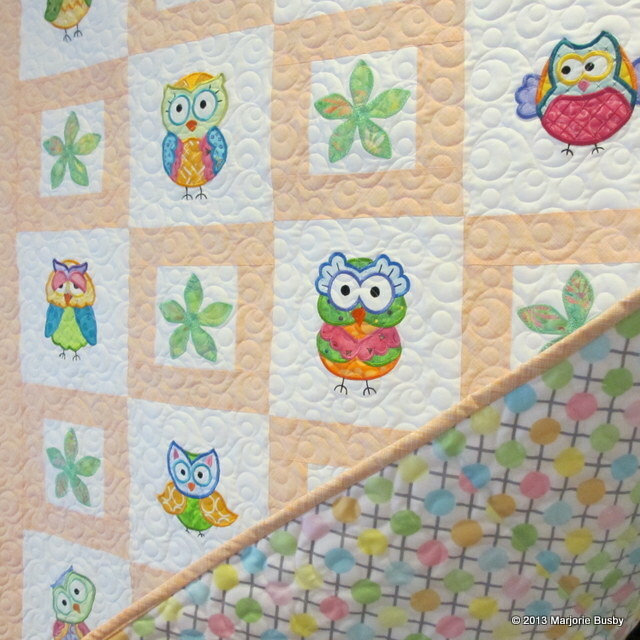 What suggestions do you have for the quilt for Katie’s Mom? I’ve been working on two new projects. One is to update and expand my breast cancer awareness ribbons and make some mug rugs to go with them.Here’s a quick look at the breast cancer awareness mug rugs. They are available for free in my Craftsy pattern store through the end of October. The other project is my effort to use up a Sesame Street novelty fabric set that I bought. With two grandsons the exact same age (born 24 hours apart), I always buy two of every novelty of this sort. I cut up the novelty print into several pieces and cut strips from the stripe and blue fizz fabric and played around with it until everything fit. It was much easier than I expected to get a rectangle out of these fabrics. It’s just the perfect size for a child to drag around wherever they go. Now, I need to get the second one done and both of them quilted this weekend. One of my grandsons has a Super Grover costume for Halloween, so this is a perfect Halloween gift for him. 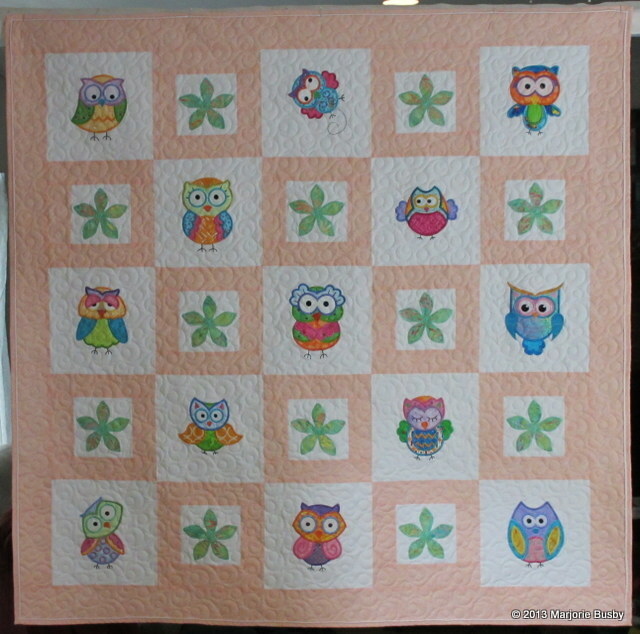 Finished the owl quilt yesterday for baby Johanna. She’s due in September and the baby shower was yesterday. I finished the quilt at 9am and the shower was at 11am, so it was a tight squeeze. But I was so pleased with it. The embroidery designs (all but one which was my design) were from DesignsbyJuJu.com owl sets 1 and 2. The flowers are my Accuquilt GO! fun flowers and I used the design that was digitized with the free-form applique embroidery edge. I quilted edge to edge with the Double Bubble Panto from Urban Elementz. Kelly at I Have A Notion (IHAN) is today’s blogger. And she is amazing–she broke her hand last week at Quilt Market and is still stitching and blogging away. I do not know how she does it. And I have been browsing around the IHAN store. If you haven’t been there, you should stop in and browse. She has quite a wonderful selection of quilting and stitching and crafting supplies, but especially some wonderful machine embroidery supplies–there are some scissors there that I must have, and I want to try a couple of her stabilizers. In addition, she has a folio blank in several colors for machine embroidery that I think will make a perfect Christmas gifts with some of my machine embroidery designs on the insert instead of the monogram. And yesterday I got a fabric package in the mail. This fabric is absolutely luscious. It is The Woodlands Palette hand dyed by Vicki Welsh. I have wanted to buy her fabric for a long time and finally took that big step. It is even nicer than I had imagined. 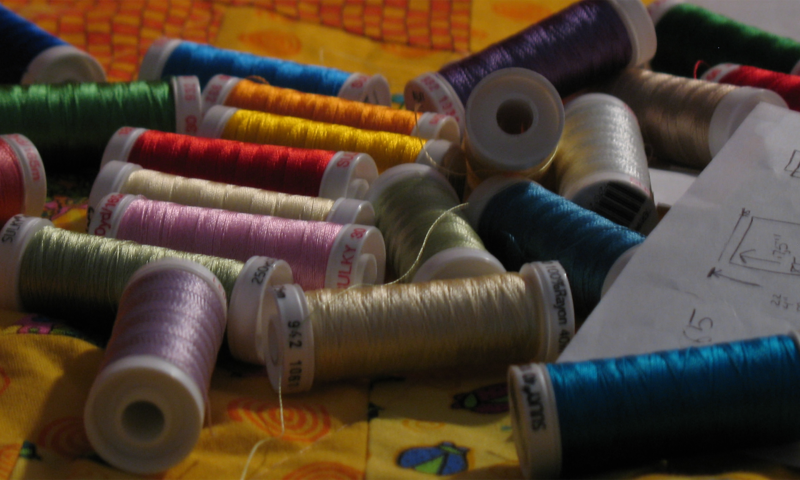 The fabric is the perfect thread count for quilting and the colors are beautiful. I can see using some of the machine embroidery designs using this fabric. I love the gradations and the soft, clear intensity of these colors. 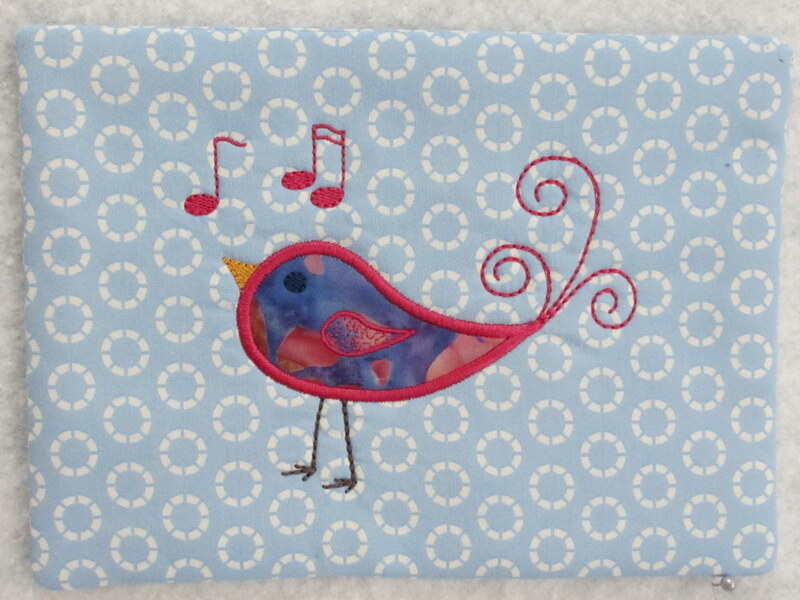 This is the cute little songbird mug rug that I made on Saturday. I see these cute little paisley birds on all sorts of graphic designs including fabric and just had to create my own take on the little paisley songbird. I used an Accuquilt GO feather for the body and the rest is machine embroidery. The single design will fit a 5 x 7″ embroidery hoop and the mug rug will fit a 6 x 8″ embroidery hoop. My next project is to create more of these mug rug designs that you can give as Christmas gifts. If you’d like to have the mug rug design and the individual bird design, just send me an email at busbyquilts at gmail dot com or click on the link below and save the file to your computer. Once you have downloaded the file, you will have to unzip it. I will keep the link active through Sunday, September 16. 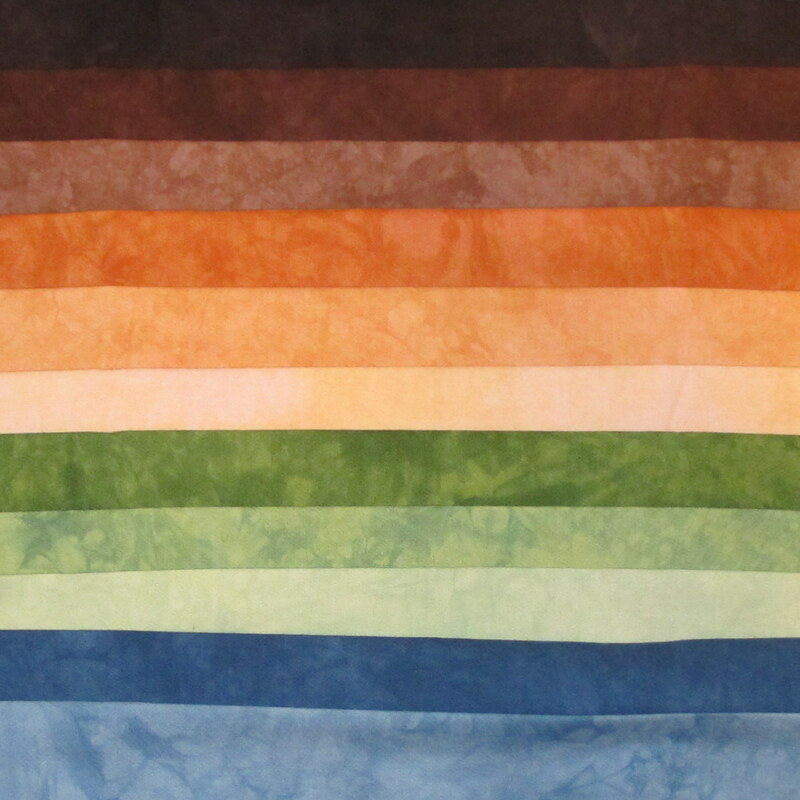 If you’d like to win one of these mug rugs already made, please head on over to Gene Black’s blog – as he is giving away a completed mug rug to a lucky reader this week. I’d love to hear from you and see your photos if you make one of these. 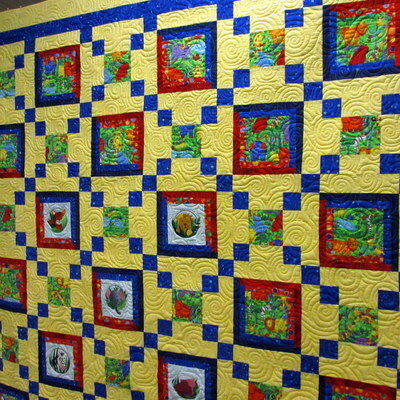 This quilt has been finished more than a week, but the photos are just now ready. It seems forever that I’ve been working on this one, but I am pleased with it. I think it’s sturdy enough for a very active 4-year old to have on his bed. He should be able to jump and play with this quilt and it will not suffer any ill effects. Function is always a #1 priority when I’m quilting. The Accuquilt zoo animals die was not available when I started this quilt, so I ended up using a different machine embroidery set. And I’m ready to start blogging again – the stars are aligning. School starts (UNC) tomorrow and the public schools start in the next two weeks. My Mom seems to be getting better after a tumble in her wheelchair a couple of weeks ago. She always wants to be independent and sometimes that stubborn independence has consequences. My embroidery machine is back from the shop and as good as new – I picked it up Saturday. The grandchildren have passed along their summer cold to me – but I am only a couple of days away from feeling great again. 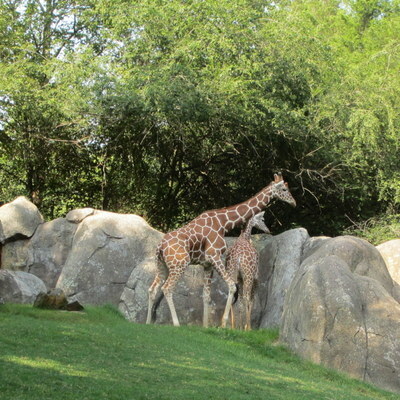 We had a great trip to the zoo last Friday with the grandchildren. My six month dental saga is almost at an end. Last week I had lunch with my good friends who are also quilters, and it was so good to see them. I am feeling refreshed and ready to go quilting again. And here’s Juma, the baby giraffe at the North Carolina Zoo in Asheboro. She’s adorable. 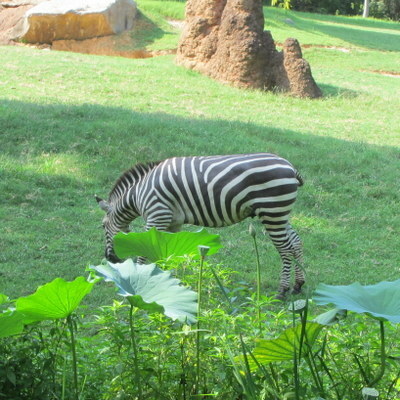 And a zebra – aren’t the patterns on the giraffes and the zebras wonderful?